Brakes slipped to a disappointing defeat in a game that they could quite easily have taken something from had they shown more guile in the final third of the pitch, writes Paul Edwards. The loss was even harder to take given that it was an own goal from the unfortunate Junior English that handed the points to high-flying Blyth Spartans, also promoted into the league at the end of last season. Having put through his own net in the 2-2 draw at Harrogate after opening the scoring there three weeks ago it was a case of wrong place, wrong time again for the hard- working utility man as he stabbed a cross from Robert Dale high into Tony Breeden’s net in the 21st minute. Indirectly, it was the home side’s first effort at goal. With Jack Edwards and Kieran Dunbar unavailable due to injury and suspension, respectively, Paul Holleran restored Joe Clarke to the starting line-up and handed Kaine Felix his full debut. The midfielder had a busy afternoon and showed plenty of the pace and neat touches that will make him an asset going forward. Ahmed Obeng also made a welcome return to the squad after being unavailable recently. 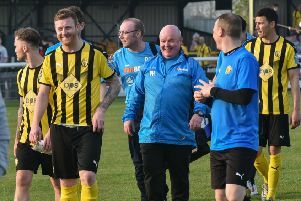 Leamington had opened well against a side that has scored plenty of goals at their Croft Park home so far this season. Liam Canavan so nearly put his side ahead as he got the slightest of touches on the ball as Jamie Hood headed it back into the six-yard box from a corner kick forced by Kurtis Revan. It looked to be sneaking into the bottom corner only for Spartans keeper Peter Jameson to spring to his right and get a strong hand to the ball to push it behind. Rob Thompson-Brown came close as he connected to send the ball spiralling just wide with a well-struck first time volley from a loose defensive header just outside the Blyth penalty area. There had been precious little to worry Leamington before the own goal, and on first glance it was difficult to tell whether English needed to get a touch to the ball as it was fizzed across the goalmouth as there did not appear to be anyone in a green and white shirt to follow up had it continued its path. Dale crashed in a drive from all of 35 yards that whistled over the bar, while Connor Gudger was unable to replicate his free-kick at Salford, driving the ball into the defensive wall as Brakes lost their way a little having conceded the first goal. Dale was at the heart of things once more for the hosts as he cut in from the right and beat James Mace before lashing a shot in towards the near post that was beaten away by Breeden. Brakes were presented with an opportunity just before half-time as Blyth coneded a needless corner on the right but as Felix played the cross to the far post Mace could only direct his header over the bar. Hood had a shot blocked early in the second half after Clarke had won a corner, while Leamington again picked up some rather soft-looking yellow cards as the half progressed. Thompson-Brown saw a great opportunity to level things up pass him by as he cut into the box from the left and beat his man before blazing his shot high over the bar. Leamington huffed and puffed as the game drew to a close but were just unable to find that final pass to unlock a well-drilled Spartans back line. The closest they came was a deflected drive from Callum Gittings that spun behind for a corner. Breeden pushed up but was left frustrated as Gudger screwed a shot well wide. Blyth had the ball in the net with the final action of the game but their celebrations were cut short by an offside flag. It was of little consequence, however, as the final whistle sounded almost immediately to seal their narrow victory. Brakes were by no means disgraced against another side in the top six, however, and with a little more fortune might have got the point their performance deserved.